The stats on how kids do are interesting, even if they only have them for French and Spanish thus far. French School students Daphne Bishop and Deangelo Robinson, who are now first graders, play together in kindergarten. The St. Louis Language Immersion school district now has three campuses – the French, Spanish and Chinese schools – and a fourth one is on the way. A group of second graders at the French School, a local language-immersion charter school, recently fought for the right to use school lockers – and won. Speaking in French, the students presented their arguments to Head of School Conrad Wildsmith. 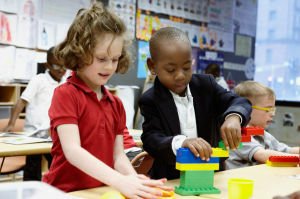 Leading an issue-oriented campaign was part of their class curriculum, but the second graders took it a step further to fundraise for the cost to pay for new locker keys – an expense that kept the school from allowing students to use the lockers previously, said Rhonda Broussard, president and founder of the St. Louis Language Immersion Schools. The second graders’ campaign is one example of what sets the immersion schools’ curriculum apart from other schools, she said.